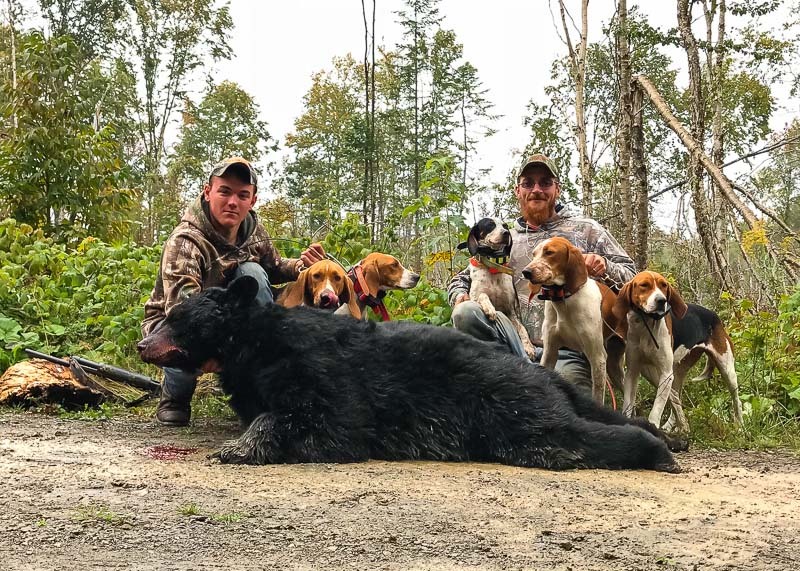 Boasting one of the largest black bear populations in the eastern U.S., hunters harvest approximately 3,400 annually of the estimated 30,000 in Maine. Conducting our hunts exclusively in Zone 1 with 140,000 acres of bear hunting territory in northwestern Maine along the Quebec border we are fortunate to have such vast uninterrupted commercial forestland neighboring Quebec. A combination of forestland, wild blueberry barrens and beech ridges provide perfect habitat to support many bear and trophy animals. 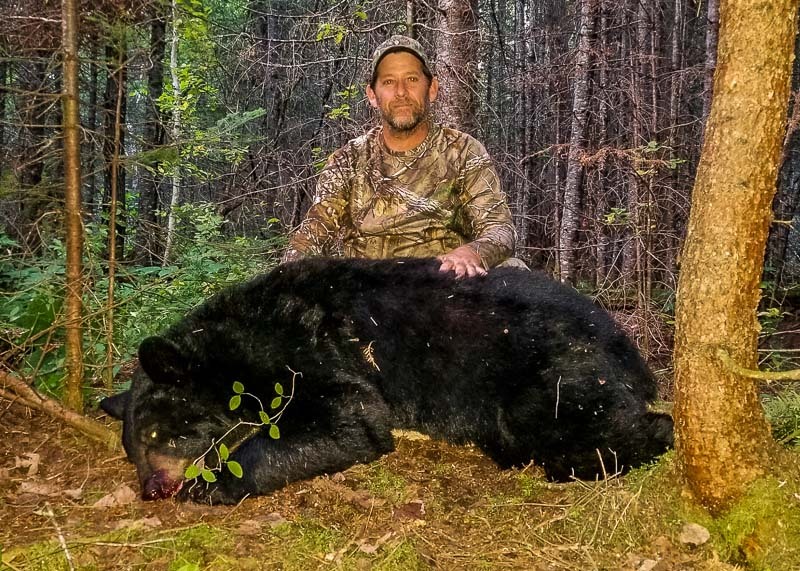 Baiting and hunting with hounds are without a doubt the most productive and successful ways to observe and harvest these northern Maine bruins. 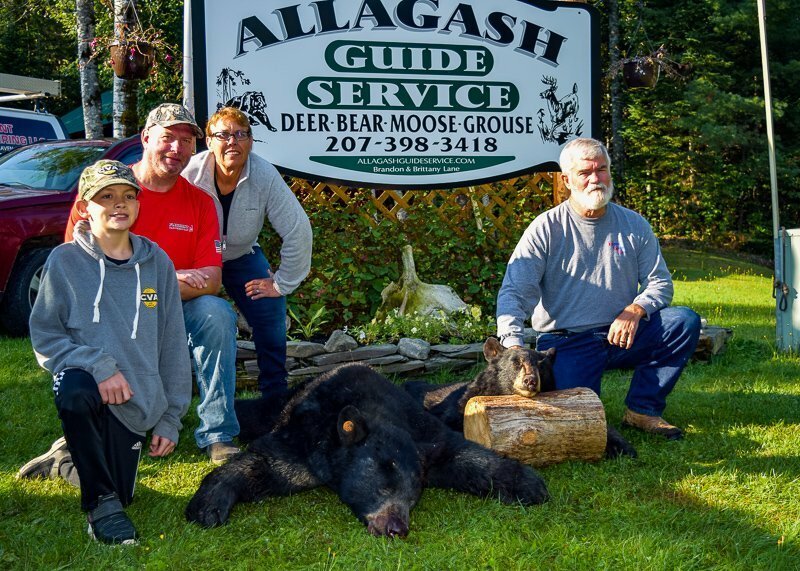 Allagash Guide Service was one of the first outfitters to offer bear hunts in Allagash, we have been in business for over thirty years. Many of our baits have been established for thirty years but active logging practices allow access to new land on an ongoing basis. Over the last 15 years we have been able to expand our hunting territory to its current level. Our region is also referred to as the North Maine Woods, NMW is actually a non-profit organization that looks after all of the recreational use of the 3.5 million acres in this region. All bear hunting outfitters that operate in NMW are provided a unique privilege of a designated bear hunting area that is exclusive to that outfitter. 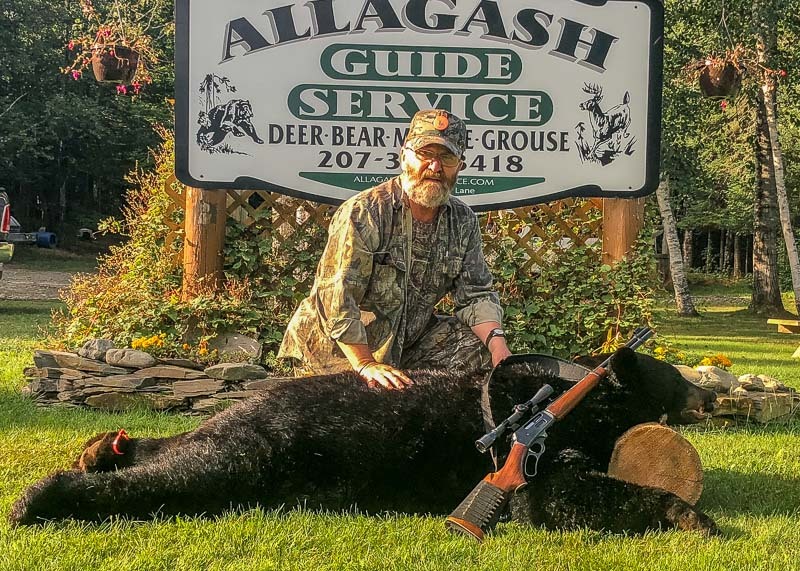 North Maine Woods not only allows outfitters to bear hunt in our areas but they also ensure that each outfitter hunts within their own boundaries and that private individuals that want to bear hunt have a designated area to do so. Hunters choosing our Lodge Hunt, enjoy a private cabin or room and have meals prepared for them in our Main Lodge. Lodge Hunts are fully guided Baited Stand Hunts or Hound Hunts, depending on hunter preference. Bait hunts are 5-day/6 night and Hound hunts are either 3-day/4-night or 5-day/6 night. For the more adventurous “do-it-yourselfer”, we offer a semi-guided bait hunt. This hunt is 6-day/7-night and includes lodging, one day of guiding and two bait sites with bait for the week. Lodging is provided in one of our private cabins or rooms in the main lodge. Semi-guided hunters will prepare their own food and be responsible for their own transportation and North Maine Woods gate fees. Contact us for more information. 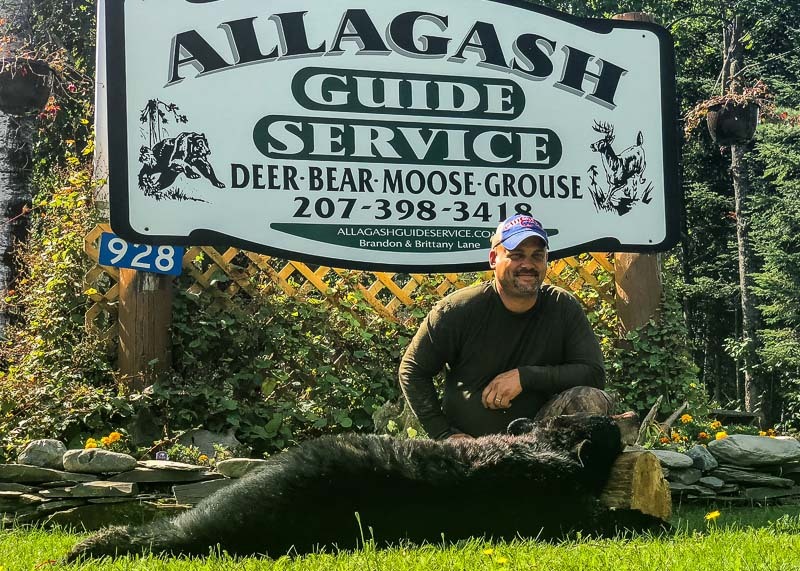 Why make Allagash Guide Service Your First Choice for Bear Hunting? A limited number of hunters per week will ensure a high quality bear hunt for you. We take no more than five hunting groups per week at the lodge. We focus on a quality hunt rather than quantity of hunters. 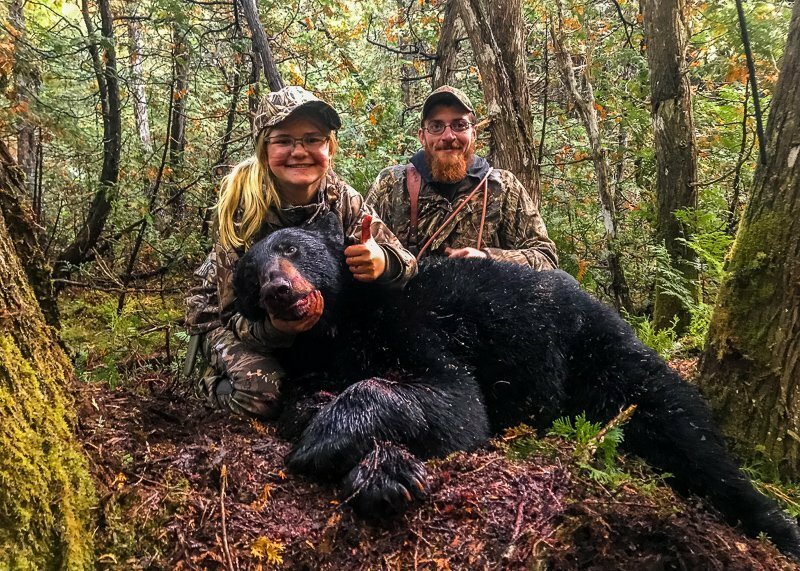 Bear territory management style: We have such expansive territory that we hunt different sections of our territory each week to preserve and grow our population. This practice guarantees all hunters fresh bait sites every week, not just the first week of the season. Our expansive territory also allows us to offer two bait sites per hunter each week, and new hunting territory every week we hunt over bait. Our bait recipe includes a variety of products, including pastries, trail mix and other sweets. We also use cooking grease and various scents for attractants. We own a 40 foot walk-in refrigeration unit to keep game fresh from warm temperatures and allow you to freeze your game before the trip home. We are local owners that make our living in this industry year round, we do not live out of state or run this business as a hobby.